Lifelong Pocatello resident, Shirley Briggs, died of congestive heart failure after a three - week vigil by her family and friends at the Idaho State Veterans Home in Pocatello. She was 93 years old. The daughter of Lyman Greenwell Tanner and Sylva Mae Connor Tanner, Shirley was born December 17, 1925, in Pocatello, Idaho. She was the fifth of eight children. 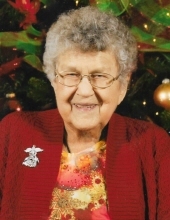 She grew up in Pocatello, attending local schools and graduating from Pocatello High School in 1944. After high school, she attended the University of Idaho Southern Branch for two years, and in subsequent years attended additional classes at Idaho State University. During World War II, she worked as a stenographic clerk for the Union Pacific Railroad. Afterward, Shirley’s primary employment was marriage and raising seven children. In 1946, she married Fergus Junior Briggs. This was in the wake of Fergus’s service in the Ninth Air Force in North Africa, Italy and France during World War II from 1942-1945. They met at a party of mutual friends, and after a courtship of several months, they were married on June 16, 1946, in Pocatello by Reverend Ed Cunningham of the First Congregational Church. Their seven children were born in Pocatello over a ten-year period from 1947-1957. They are, in order of birth, Kristine Halperin (Michael) of Carmel Valley, CA; Marine Colonel (Ret) Fergus “Paul” Briggs (Gina) of Pocatello, ID; Eric L. Briggs of Pocatello, ID; Rachael Briggs of Bozeman, MT; Margot Parker (Dave) of Bozeman, MT; Darrel A. Briggs of Pocatello, ID; and Lisa Erickson of Bozeman, MT. Shirley and Fergus had 9 grandchildren and 11 great-grandchildren. After her children were grown, Shirley began working full-time in 1974 at the Bannock County Nursing Home as a Medical Records Secretary. She then obtained a career position with the Idaho State Department of Health and Welfare from 1976 until her retirement in 1991. Her initial assignments were administrative positions with the Youth Rehabilitation Office. Later, she joined the support staff of the Self Support Unit, placing welfare clients into meaningful employment and life pursuits. Shirley found much enjoyment in her contribution to helping others progress in life. Past activities include the Baptist Mission Society, Women’s Circles of the First Baptist Church, Parent Teachers Association, Girl Scouts, Campfire Girls, Cub Scouts, 4-H Club, and League of Women’s Voters. After her retirement, she was actively involved with Red Hat Mamas in Pocatello; and at Island Park with the Targhee Women’s Club, the Historical Society, the Interpretive Society at Johnny Sack’s Cabin, water aerobics and hiking. She loved family get-togethers. Shirley was preceded in death by her parents as well as her brothers Kenneth, Horace, and “Jim” Tanner; and her sisters Phyllis Martin, Sybil Hathaway, Elma Armstrong and Margaret Spiker. Her body will be interred alongside husband Fergus in Pocatello’s Mountain View Cemetery following a 10 AM viewing and an 11 AM service at Downard Funeral Home, officiated by Pastor Mike Papovich of the First Baptist Church. The Briggs family wishes to extend special thanks to the staffs of Quail Ridge Assisted Living and the Idaho State Veterans Home Pocatello for their superb care and assistance for our beloved mother. To send flowers or a remembrance gift to the family of Shirley Tanner Briggs, please visit our Tribute Store. "Email Address" would like to share the life celebration of Shirley Tanner Briggs. Click on the "link" to go to share a favorite memory or leave a condolence message for the family.